New year is a world celebration . Every country will have their celebration for welcoming a new year . But do we ever realize that there’s one country or island celebrate the new year before than other country in the world ? Tomorrow is the first day of 2019, still left in our mind the new year celebration that we had last night . Fire work and a bit alcohol drink for warming up . Here in Bali Island in every place we can find a group of peoples gather together and waiting for the new year 2019 coming . Some of them just making a space in front of their house . They are cooking , mostly cook fresh grill fish accompany with beer or local alcohol . What a fun !!! For some peoples with extra money ( wealthy family ) will go to some resort , restaurants , pub for their new year celebration . But do you know that all around the world , we are celebrating a new year in a different time . Counted there are 39 different time around the world and 26 hours to complete the new year celebration around the world . From all thus different world clock time , there will be always a first and also the last country who celebrate the new year in the world . Its Samoa , small country in Pacific ocean who celebrate the 2018 new year before than other country . 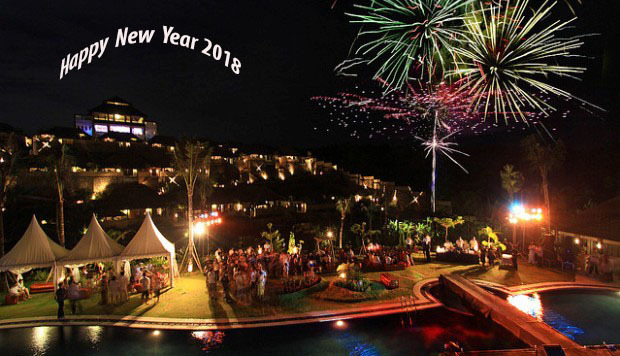 They celebrate the new year 7 hours before our local time here in Bali . lets say they will be celebrate their new year at 17 : 00 pm our local time . If Samoa celebrate the new year before than other , there are few island around United states territory who celebrate the new years for the last one . Thus island such as Baker island , Howland Island also some small island around there . Especially Samoa, New Year has always been a blessing. Where many tourists come to celebrate the new year. They want to be the first to meet the new year of 2018 . Happy new year 2019 to everyone , wish 2019 will bring you joy , happiness and best luck . hopping 2019 will make all of our dream come true .